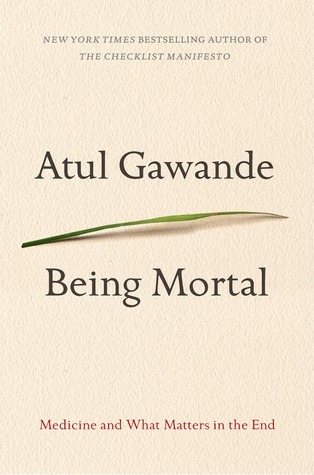 I was happy to hear that one of my book groups chose Being Mortal: Medicine and What Matters in the End by Atul Gawande as our January selection because it's a book I've been meaning to read since its release in 2014. This thoughtful book written by a surgeon about aging, serious illness, and dying is sometimes difficult to read but also very, very important. I learned a lot from it, and it opened my eyes about several topics related to end-of-life issues. The author weaves together a variety of threads, all about mortality: what is taught to doctors in medical school (almost nothing); stories of his own or other doctor's sick, elderly, and dying patients; interviews and time spent with experts; and his own very painful and personal story of his father's long illness and death. He discusses in detail the way that the medical community today deals with serious illness, aging, and approaching death; for the most part, they seek to prolong life for as long as possible, even if that is not in the patient's best interests. Technology has perhaps outpaced humanity in this realm - just because we can artificially prolong life doesn't always mean we should - and the patient's wishes are often not taken into account. Gawande also delves into the subject of assisted living and nursing home care, which is an eye-opening discussion. Through visits, interviews, and research, he describes the current - mostly deplorable - state of these institutions. As depressing as some of those passages are, the author also searches for and finds many people and organizations who are working hard to change that status and highlights some of the most innovative and exciting developments in the field. Caregivers are not overlooked here; the challenges and difficulties facing close family members are explored as well. And, yes, he examines the difficult topic of death itself, with input from patients, doctors, and hospice workers on what happens currently and what should happen ideally. Woven throughout the narrative is his own story of his father's journey, from terminal diagnosis through increasing symptoms, the need for greater care, hospice, and finally, death. This is often a difficult book to read, in part because, as seen in the huge turnout for my book group and extensive discussion we had, every reader has his or her own personal story: of a loved one's illness or aging, serious illness in oneself, and/or the difficult and prolonged death of someone close. For me, much of this book brought back painful memories of my dad's death from melanoma a few years ago. Though he was fortunate to stay in his home until his last week, and we were fortunate to have a full - mostly good - year with him after his diagnosis, that last week in hospital hospice (which is nothing like the wonderful at-home hospice described in the book) was difficult and painful for all of us. In addition, I related to some passages about serious illness because, though I am not dying of cancer or some other degenerative disease, I am living with chronic illness, which has some similarities. Finally, my 93-year old father-in-law is currently in an independent living apartment but having more and more trouble moving around and approaching the day when he will need more care than we can provide. Our discussion in book group was interesting, engaging, and in-depth, and it seemed that everyone had their own story to tell. While some aspects of the book were depressing, to consider the poor state of institutions today and how patients' best interests are not always the first consideration, it was also hopeful to hear about some of the people trying to make things better and the innovations in nursing home care and hospice. All in all, though it is sometimes a difficult read, this is a powerful, thought-provoking, and important book that everyone should read, so that we can all help to make the world a better place for the sick, elderly, and dying - a group that every one of us will join one day. Listen to a sample of the audio book. Or you can order Being Mortal from Book Depository, with free shipping worldwide. I had great and important conversations with my parents when I read this book. The idea of not doing "one more test drug" and thinking about how we want to spend our last days, weeks, or months should we become terminally ill were good conversations to have. Wow, that is so great, Helen! That's a tough conversation to have - I am so impressed you did it. My dad a few years ago and my mom is not big on open & honest discussions - she tends more toward denial & avoidance! We definitely know my FIL's wishes because he tells us weekly that he's ready to die! I thought this was a really important book and I enjoyed reading it, but I wouldn't have thought to suggest it to my book club. I'm considering it now though. It does seem like it would make for some good discussion. Yes, we had a great discussion in our group! definitely worth suggesting to yours.